The University of New Brunswick has earned a place in the top 10 of all United Way campaigns in the province. 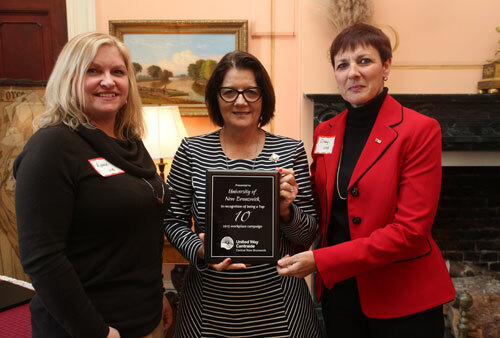 UNB was lauded at a recent ceremony held by the United Way at Government House in Fredericton for its efforts. UNB has been an active contributor to the charitable group’s campaigns for many years. The Fredericton campus has raised more than $62,685 in 2015 – ranking it sixth in central New Brunswick. Since 2011, more than $329,000 has been raised by the Fredericton campus campaign. This is something that is no surprise to Shelley Clayton, director of financial aid office in Fredericton. Jeff Richardson, executive director of United Way Central NB, said the ongoing commitment of the staff, faculty and retirees of UNB to their community is inspiring. The dedicated donors on the Saint John campus also raise money every year to the benefit of United Way fundraising in the Saint John area – about $95,000 over the last decade. A donation to United Way reaches a wide variety of health and human care agencies that provide essential services to children, youth, families, seniors and the disabled. For more information on UNB’s efforts to raise money for the United Way or to contribute, please contact Shelley Clayton on the Fredericton campus or Tara Smith on the Saint John campus.